Like a lot of people of a certain age, I’ll never forget the night I watched The Beatles on “The Ed Sullivan Show.” It was February 9, 1964, I was 7 years old, and John Lennon, Paul McCartney, George Harrison, and Ringo Starr had just invaded America. Coming scant months after the assassination of President Kennedy, the whole country (or at least 73 million television viewers) was ready for an evening of guilt-free fun. Even more memorable was an afternoon a couple of years later, a day or two before August 29, 1966, when The Beatles were scheduled to play Candlestick Park, then the home of Willie Mays and the San Francisco Giants. My friend Billy had offered me a ticket to the show, as well as a ride with his big brother. It was a done deal, all I had to do was say yes. We didn’t know it at the time, but that concert at Candlestick would be The Beatles’ last. Apparently, a lot of other people didn’t know it either: The show was not even close to sold-out. 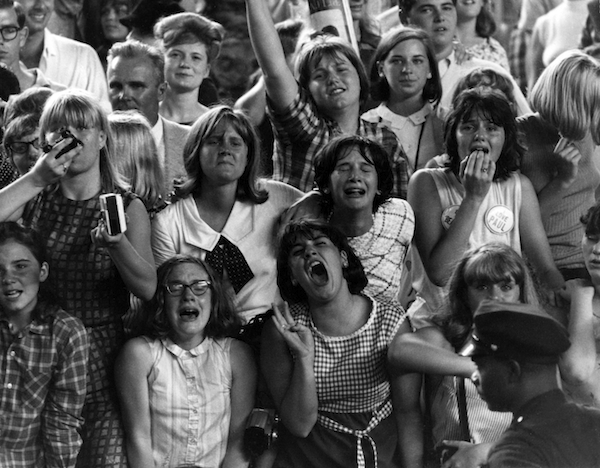 Above: Female fans at Shea Stadium in New York, August 15, 1965. Photo: Robert Whitaker. Top: The Beatles played the Cow Palace in San Francisco on their 1964 North American tour. Photo: Mirrorpix. With the golden anniversary of the Fab Four’s first visit to North America upon us, many are thinking about their half-century relationship with The Beatles, whether it’s the first time they heard “Tomorrow Never Knows,” that late night in their dorm room when they realized that Paul McCartney was singing the words “the doctor came in, stinking of gin” in “Rocky Raccoon,” or, as in my case, the fateful afternoon they decided not to see the band for free because of musical principles that now seem indefensible. This month, a two-volume chronicle of The Beatles’ official tours in 1964, ’65, and ’66 called “Some Fun Tonight: The Backstage Story of How The Beatles Rocked America: The Historic Tours of 1964-1966” takes a behind-the-scenes look at Beatlemania back in the U.S. of A. The 618-page, hardbound boxed set, written by Chuck Gunderson and retailing for $175 (including postage in North America), tells the real story of what those tours were like in the words of the DJs, promoters, and people who were there, brought to life via some 450 photographs of the band performing their 11-song sets, giving increasingly impatient press conferences, and fleeing the affections of their frenzied fans. 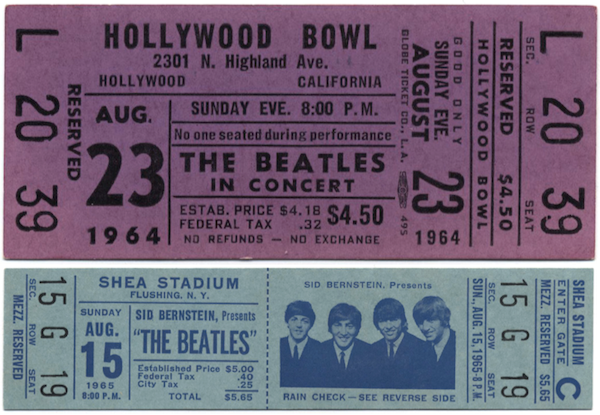 Tickets for Beatles shows in 1964 at the Hollywood Bowl and 1965 at Shea Stadium. 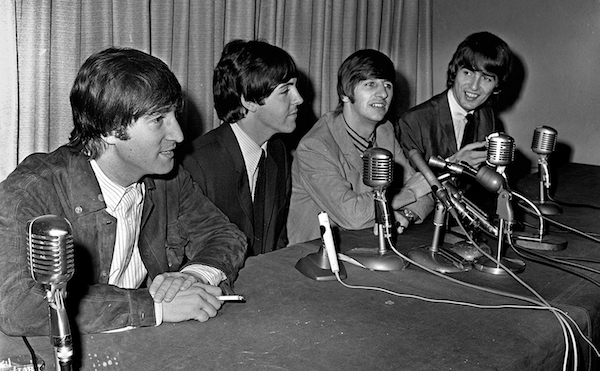 A press conference in Boston, September 12, 1964. Photo: Kevin Cole. But Charlie Finley, who owned the Kansas City Athletics baseball team, had promised his city a Beatles concert, so he started working on the band’s manager, Brian Epstein, from the moment the tour began in San Francisco. Finley was prepared to pay top dollar to bring The Beatles to Kansas City, which is saying a lot, since they were already the best-paid act in show business. Gunderson’s book features images of behind-the-scenes memorabilia, such as this press pass issued to disc jockey Ken Douglas of Louisville, Kentucky, radio station WKLO. 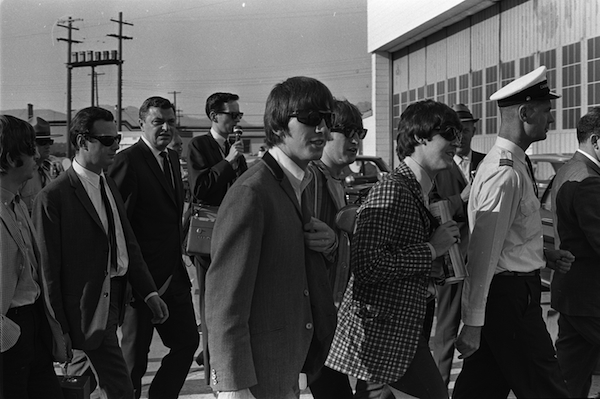 The Beatles and their manager, Brian Epstein (at left, in sunglasses and white shirt), arrive in Vancouver, B.C., 1964. Photo: Deni Eagland/Vancouver Sun PNG Merlin Archive. “You’ll notice in many photographs in the book that they have set lists taped to their guitars,” says Gunderson. “Ringo had one on top of his bass drum. The shows would run anywhere from 28 to 34 minutes. They didn’t need to re-tape a new list every night. That was the set list.” In the end, the band relented a bit, adding a Little Richard-inspired medley of “Kansas City/Hey-Hey-Hey-Hey!” as the opening number for their Kansas City show. 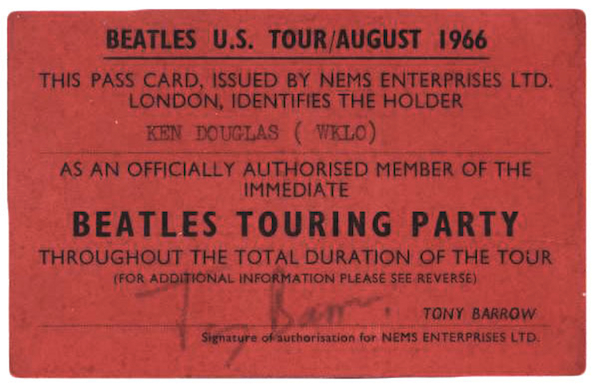 All three tours featured supporting acts, so for fans paying the average ticket price of $4.50 in 1964 (Finley’s Kansas City shows were the most expensive, with some seats selling for $8.50), they were getting a lot more than just a half hour of The Beatles. The first tour featured Jackie DeShannon (she had a minor hit at the time with “Needles and Pins”), Bill Black’s Combo (Black had been Elvis Presley’s bass player, but he was too sick to play the tour), the Exciters (“Tell Him”), and the Righteous Brothers, who were stars in their own right but were replaced by Clarence “Frogman” Henry (“Ain’t Got No Home”) early in the tour after the Forest Hills, New York, performances. 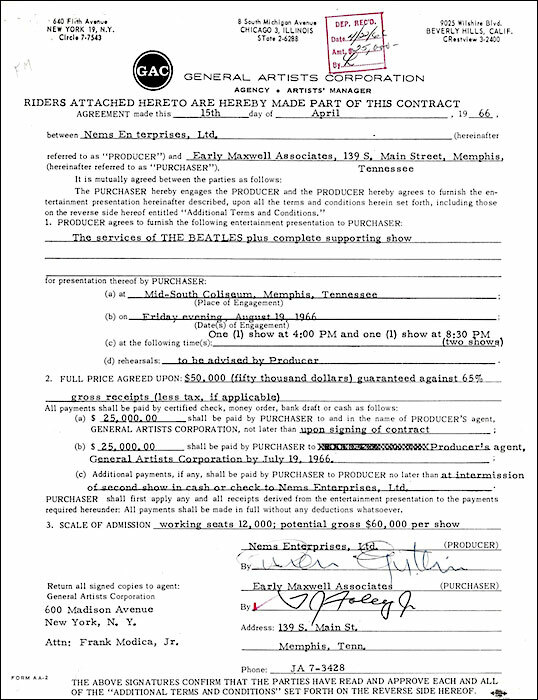 This 1966 contract for two performances in Memphis, Tennessee, guarantees The Beatles and its supporting acts $50,000. The 1965 tour featured support from Motown singer Brenda Holloway, the King Curtis Band, Cannibal and the Headhunters, a Brian Epstein-managed group called Sounds Incorporated, and the Discotheque Dancers. In 1966, Beatles fans were treated to performances by a Boston band called The Remains fronted by Barry Tashian, a short-lived group called The Cyrkle (their single was “Red Rubber Ball”), Bobby Hebb, and the Ronettes, who sang “Be My Baby” and their other hits without lead singer Ronnie Bennett, who was forbidden by her jealous future husband, producer Phil Spector, from going on the tour with The Beatles. 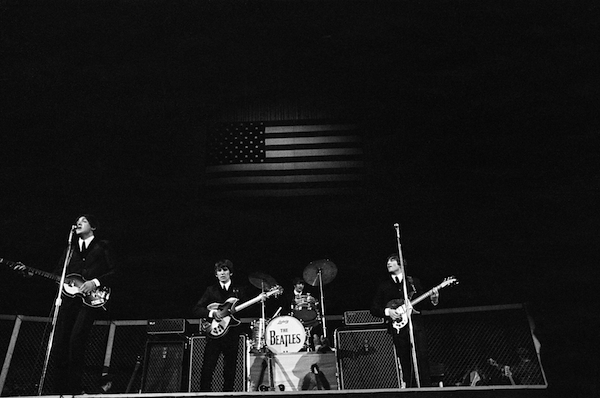 If the 1965 tour is remembered for being even more profitable than the first (it was completed in half the time, with many dates featuring two shows in the same venue), the 1966 tour was overshadowed by controversy over comments John Lennon had made many months earlier, in which he was quoted as saying that The Beatles were “more popular than Jesus.” While the context of the remark had been about the perception others had about The Beatles, a teen magazine called Datebook turned it into a boastful brag on the part of Lennon, provoking the burning of Beatles albums and protests at concerts by the Ku Klux Klan. 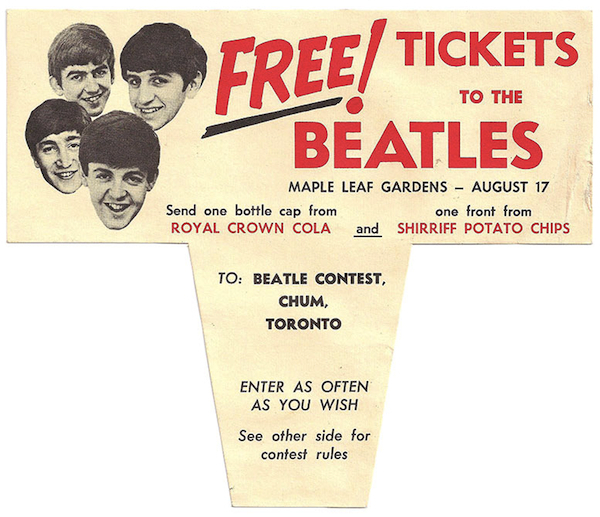 A promotion for the band’s 1965 show in Toronto. That suggestion was followed, but then the local promoters had to scramble to fill the large ballpark after Lennon’s allegedly controversial comment depressed ticket sales. 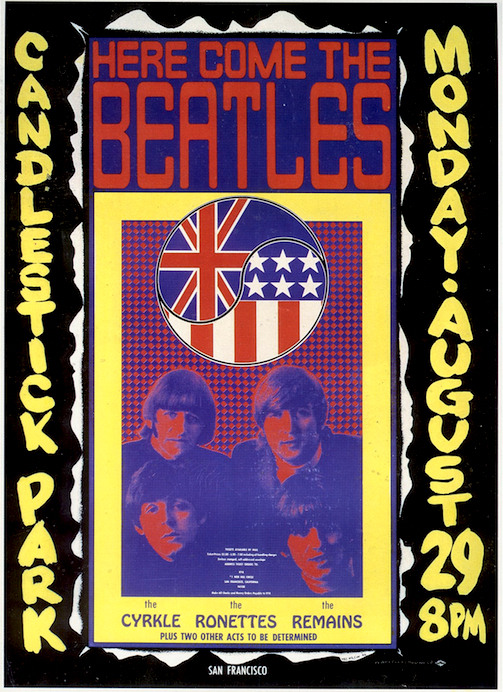 Which led to a rarity in the history of Beatles tours in North American, a show poster. In 1966, local promoters hired psychedelic rock artist Wes Wilson to design a poster for what would be the last performance by The Beatles. After the final chords of “Long Tall Sally” had faded away into the cool Candlestick night, The Beatles as a live, touring band were no more. Already burned out and dissatisfied by the fish-bowl existence that came with being on the road, they turned inward, focusing their considerable creative energies on studio albums. In retrospect, it’s difficult to argue that giving up touring was the wrong decision, since it led directly to classics like “Sgt. Pepper’s Lonely Hearts Club Band” in 1967, “The White Album” in 1968, and “Abbey Road” in 1969. Those recordings, along with “Revolver” in 1966, are routinely ranked among the greatest albums of all time, whose audio quality stands in stark contrast to the dissonant cacophony that awaited North American fans in 1964, ’65, and ’66, when the best one could hope for was a fleeting glimpse of John, Paul, George, and Ringo straining to be heard in an echoing basketball arena or acoustically challenged baseball park. Even so, I wish I’d been there. 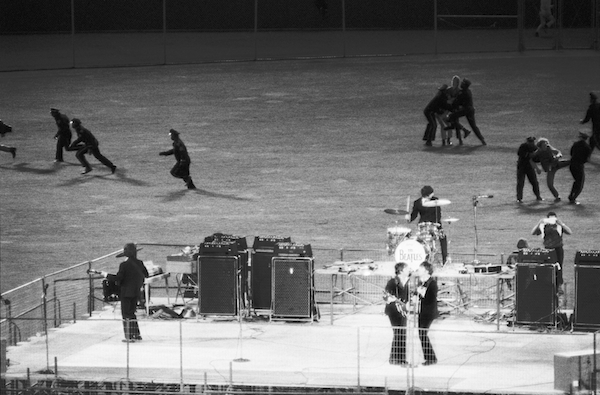 Police clear the field of fans as The Beatles perform in Candlestick Park, San Francisco, California, August 29, 1966. Photo: Bettmann/CORBIS. Bob Eubanks (Newlywed Game host) was the promoter who first arranged the Beatles tours in the US. Buy his book too. A very good read. I turned down free tickets to a Stones concert because I was into the Beatles. Not quite as bad as Ben’s mistake, but still . . .
You want details on the US 64-66 tours? This is the end-all and be-all book and for those of you who look for Spizer-level research, this two volume set is exactly what you are looking for. Gorgeous photos, mind-blowing details and a heavy stock paper make this the best Beatles book published in 2014 and one of the best ever period. Without question. Attended Sir Paul’s “Out There” concert here in Minneapolis last night (02 August). Incredible show because the songs were recreated and not reinvented for a younger audience. He played just shy of 3 hours; a true musician. Beatles music is timeless. “ ” If this guy wants to paint a naked lady on the back of the jacket, why stop him? He could be dead tomorrow.